To purchase a copy of the report, please use the order button at the end of this page. The shadow of the financial crisis has dominated the banking and finance industry for nearly a decade. It has challenged the business model of large parts of the industry, driven the relentless programme of regulatory reform, and fuelled the public anger at the industry for what often seems like a lot longer than 10 years. We thought it would be useful to measure the actual impact of the crisis on different sectors of the capital markets industry by comparing the world in 2006 with the world in 2016. We were surprised more by how little has changed than by how much, with three notable exceptions: investment banks have been hammered, alternative assets (such as hedge funds, private equity and venture capital) have flourished, and European capital markets have shrunk dramatically. The report covers 16 different sectors of the industry, from banks, investment banks and asset managers, to pools of capital, capital markets activity, exchanges, trading volumes and regulation. We’ve analysed the impact of the financial crisis on hundreds of metrics in global capital markets, and adjusted them for GDP growth and inflation (a blanket 20% over 10 years to reflect the fact that a $1m bonus in 2006 was worth a lot more than $1m today) to provide a more accurate understanding of which sectors and markets have suffered, which have kept their heads above water – and which have flourished. (For a summary of the changes in real terms and relative to GDP across 40 metrics, click here). * What has changed in terms of scale in different sectors of the capital markets industry? * What does that change look like adjusted for inflation and relative to GDP? * How has the geography of different sectors changed? * How have the economics of different sectors changed? * And what are the main challenges ahead for the next decade? 1) Too big to shrink: the biggest banks in the world have got bigger but less profitable over the past 10 years. Assets are up by more than a quarter in real terms but profitability has dropped by a third. The world’s 20 biggest banks have grown faster, with assets increasing 40% in real terms. Most of this growth has been in Asia: in Europe banks have shrunk significantly relative to GDP. Banks are safer and have more than twice as much capital today (depending on which measure you use). 2) Dazed & confused: investment banks have fared worse than any other sector of the industry through the financial crisis. Revenues have dropped by a third and pretax profits have nearly halved in real terms, while return on equity has plunged by more than two thirds. Costs have only fallen by 15% and for all the job cuts, headcount is only down by a few percent. 3) Weathering the storm: the asset management industry has emerged from the financial crisis relatively unscathed. Assets under management have increased by more than a quarter, but outside of the US, assets have shrunk relative to GDP. While the industry is much bigger it is only marginally less profitable today than it was a decade ago. 4) A shift in geography: in virtually every sector in the capital markets (most notably with banks and in the corporate bond and IPO markets) there has been a clear shift in the balance of power over the past decade from shrinking markets in Europe to faster-growing markets in Asia. US markets have also grown in real terms and relative to GDP. 5) A deeper pool: the pools of long-term capital such as pensions and insurance assets that are essential to well-functioning capital markets have grown in real terms but have struggled to keep up with rising GDP outside of the US, particularly in Asia. Meanwhile, wealthy individuals with assets have got wealthier. 6) The great rotation: investors and issuers have shifted significantly from equities to bonds over the past decade. Stockmarkets have shrunk relative to GDP in every region outside of the US, but global corporate and government bond markets have grown by two thirds in real terms. 7) Capital markets activity: this shift is also clear in capital markets activity. IPO activity has halved in real terms over the past decade but corporate bond issuance has more than doubled in real terms. Global M&A activity has shrunk by a third relative to GDP and investment banking fees have dropped by a quarter in real terms. 8) The engine room: trading volumes have continued to rise over the past decade. Relative to GDP equity trading and corporate bond trading have increased by more than a quarter, while derivatives and FX trading have increased in real terms by around one fifth. Exchanges have benefited from this growth: they are the only sector to emerge from the crisis both bigger and more profitable. 9) An alternative option: hedge funds, private equity and venture capital have flourished over the past decade with a surge in assets under management in real terms of between 70% and 110%. The persistence of high fees has not been matched by performance (except for venture capital). 10) Changing of the guard: the international framework for supervision and regulation has been transformed by the crisis, with more than 30 new agencies set up in the EU and US alone since 2006. Budgets at regulators have increased by a third in real terms and staff numbers are up 40%. Feeling the squeeze: pay and bonuses have fallen sharply in the industry. 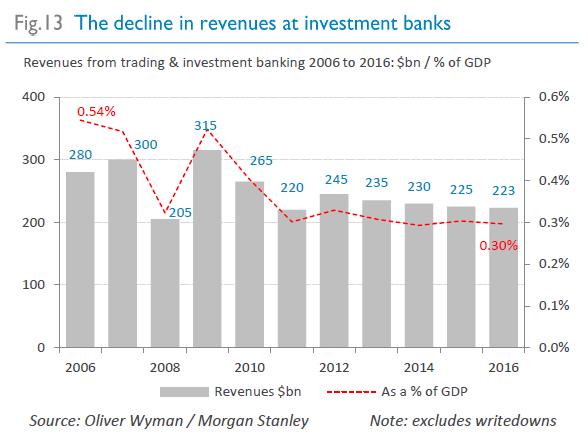 Average pay at investment banks has dropped by 44% in real terms and pay represents a much smaller proportion of revenues and costs than in 2006. Average pay at asset managers has fallen by 7% in real terms. Average pay for bank CEOs has halved in real terms, to just $11.4m. New Financial is capital markets think tank launched in 2014. We’re having a growing impact among senior industry leaders and policymakers across Europe on making the case the case for bigger and better capital markets. In the wake of the financial crisis there is a huge opportunity for the industry to embrace change and to work with its customers and policymakers to rethink capital markets.